Fine motor skills are one of the most vital in handwriting as it is the coordination of the small muscles with each other and our eyes. Notably they are the muscles in our hands, fingers, eyes, feet and toes. As I mentioned Somedays I just Wonder– J has some fine motor issues. I’ve known that. He only learnt to use a pair of scissors after he was four. His nursery that he attended was more academically focussed than creative or play focussed and so his fine (and gross) motor skills aren’t wonderful. So here are 5 activities that I am using with him to develop the skills that he needs to write. I love play dough. I make my own which lasts about a month. 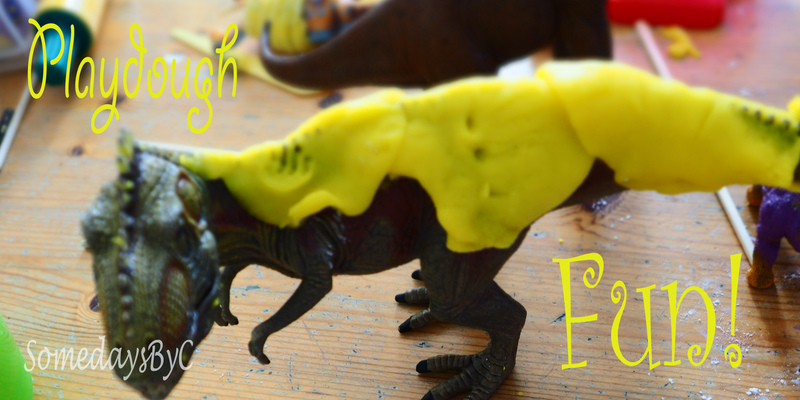 The children love creating things, making ‘biscuits’ or as in the most recent session- dinosaur clothes. I have a bag of cutters etc and they all have a ball.Surprisingly I suspect that K loves it the most despite being 10! If you don’t fancy making your own- you can buy some quite cheaply from Amazon and they have an amazing range of play dough toys and sets. This one seems so obvious. To start the cutting can be simple cuts on a page. Leading onto cutting a page in half. To cutting out large shapes. To cutting out small shapes. Sometimes, it might be helpful to buy the “scissors that bounce back”. This will enable a child whose fine motor skills aren’t very strong to use the stronger set while the weaker ones are still developing. When the child is ready, then purchase a pair of child scissors. Please be careful on your choice. It is incredibly frustrating for a child to try and cut with a pair of scissors that are so child safe they don’t cut!Or for that matter aren’t correct. If your child is a ‘lefty’ please try and buy him a pair of ‘lefty’ scissors. It will make his life SO much easier. It is also a wonderful opportunity to teach a child of the importance of walking and holding a pair of scissors safely. I don’t mean origami here- though that would fall into this category. I’m thinking paper tearing, paper folding and attaching it together through sticky tape, glue or stickers. Simple tears on a page or tearing bits off a paper ribbon or streamer. Leading onto tearing a page in half. To tearing out large shapes. To tearing out small shapes. J loves cooking so I’m using this one a lot as it’s easier to engage him this way. I love the program on CBeebies entitled “I can cook ” and the choice of words that Katie uses to help the children to mix their foods. The ‘tickle’ the flour and butter together. Isn’t that just a great way to get the children to visualise how their fingers should be moving and doesn’t that just explain beautifully how the fine motor skills are being used. Cooking also introduces a variety of textures. From handling meat, to dough to bread to fruit and veggies. The ‘Children’s Step by Step Cookbook’ by Angela Wilkes is is our favourite children’s cook book. It has a variety of recipes fom snacks and treats to easy meals. Cooking skills- cutting, sautéeing, folding etc. Lego is an amazing ‘toy’ that can be used to develop all sorts of skills. Building from a set of instructions requires (and so develops) visual focussing, concentration, number recognition, matching, motor planning, organised physical movements and hand eye coordination. Building a creation of ones own design requires most of the above as well as creativity, planning, and problem solving. And so, I’m sure, I could go on. It is also not just limited to the younger children. 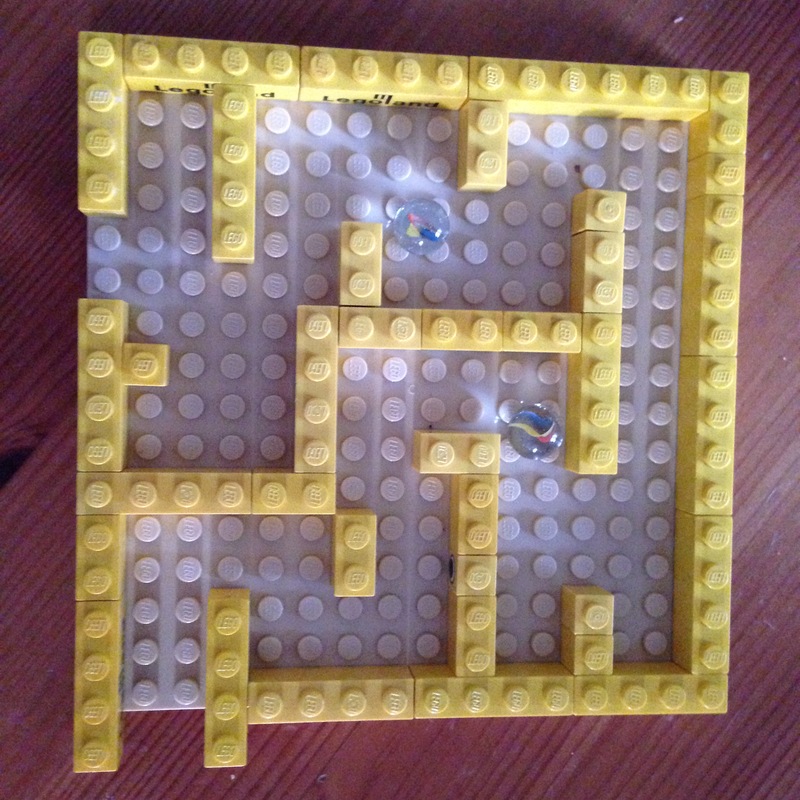 I made this labyrinth, so J could manipulate it and get the marble through. (Another great activity for various skills). It definitely challenged my creative problem solving skills as I worked out a route for the marble to take and make it challenging for J.
I got the idea for this (and lots more great Lego ideas) from Frugal Fun 4 Boys. So those are My 5 favourite activities to develop my sons handwriting skills. This entry was posted in Fun Days, My 5..., Parenting and tagged 4-6 year old activities, cooking, cutting, fine motor skills, lego, origami, paper tearing. Bookmark the permalink.